A resolutely masculine fragrance born from the sun, the earth, and the breeze of a Mediterranean island. 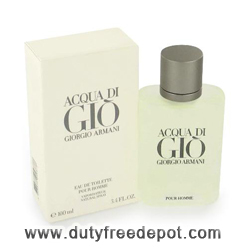 Transparent, aromatic, and woody in nature, Aqua Di Gio Pour Homme is a contemporary expression of masculinity. Marine notes, mandarin, bergamot, neroli, persimmon, rosemary, nasturtium, jasmine, patchouli, and cistus create the modern signature scent for him.This luxury-sized bottle gives you more of your signature scent.Notes:Marine Notes, Mandarin, Bergamot, Neroli, Persimmon, Rosemary, Nasturtium, Jasmine, Amber, Patchouli, Cistus.